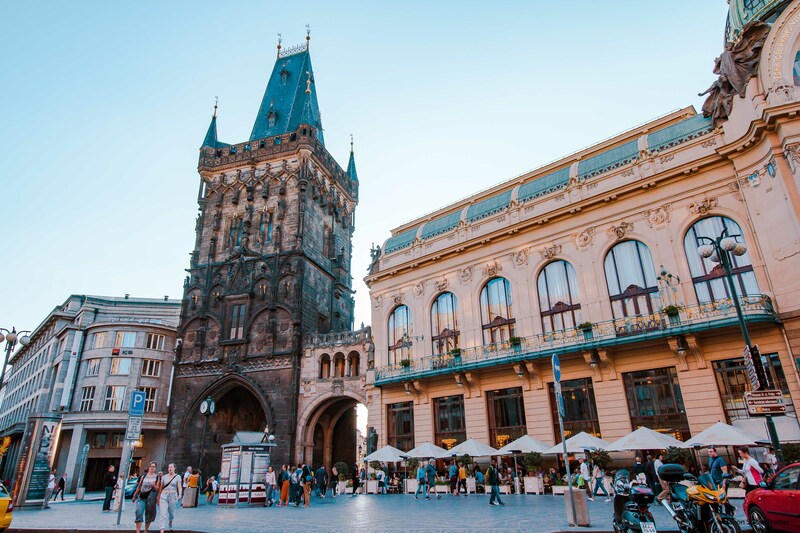 Here are several days that we have returned from our trip between Prague and Naples, it is time to tell you a little more about Prague, the city of the Thousand steeples. First of all, once is not custom, we went through Booking.com to book our holiday. Most of the time, I prefer the easyjet/air BnB combo that allows you to be more in the heart of cities and their daily lives. Only we got there four weeks early, it leaves little margin to find the best rates. There are many sites that allow you to book at the last moment, "Pirate voyages" or "Baby Pack your Suitcase". You'll tell me, but why Prague? 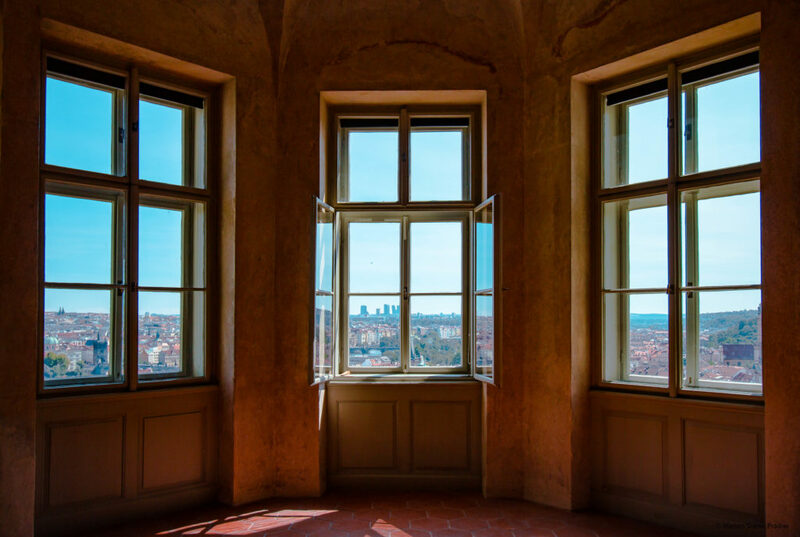 Most people go to the sun in the summer: Barcelona, Tunisia, Rome… Simply because we have heard a lot about it and it is a very lively city without being beset by tourists. And, unlike other destinations, like Santori I have not seen pass hundreds of photos on Instagram so I do not feel like I have already done the trick. We flew from Nice on Saturday 18 August very early in the morning, which allowed us to enjoy our day in Prague when we arrived. The return was made on Tuesday 21 in the afternoon to not run after the plane. So it's three nights and four days on the spot. 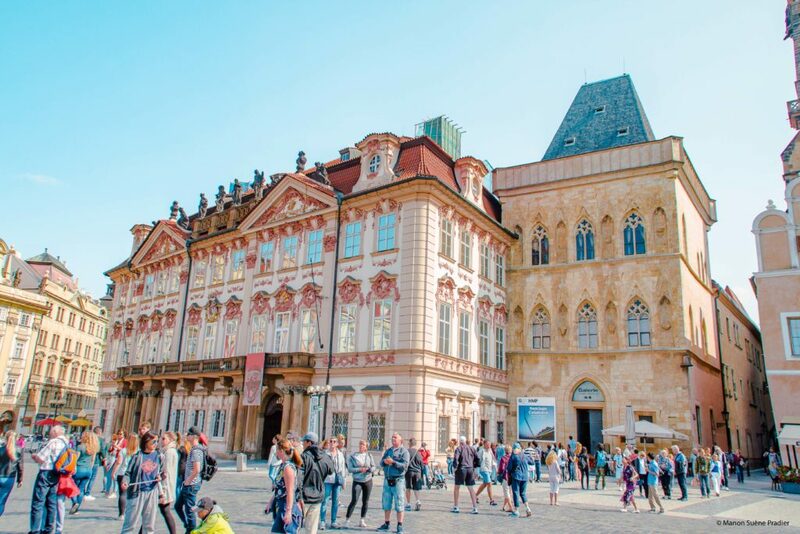 Prague is not a huge city, you have time to see many things in four days, but certainly not all that the city has to show you… We have, for example, passed the impasse on the museums which are still very well known. I will not necessarily respect the chronological order of our stay because we have done a lot of detours. 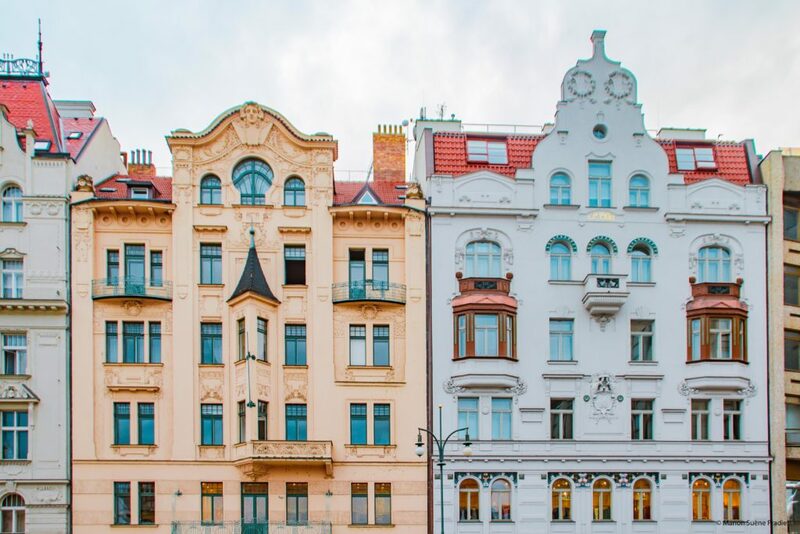 Here is rather an exploration of Prague by neighborhoods. 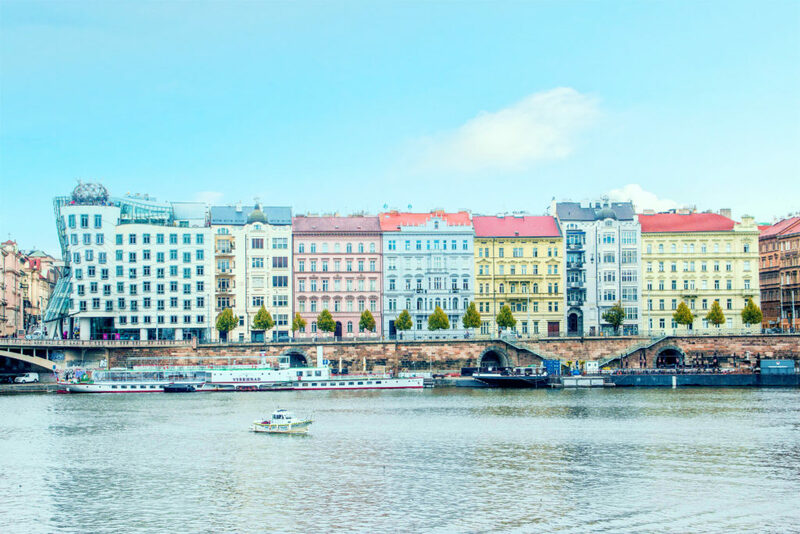 I hope this article will make you want to discover "Praha" and all these wonders, good reading! 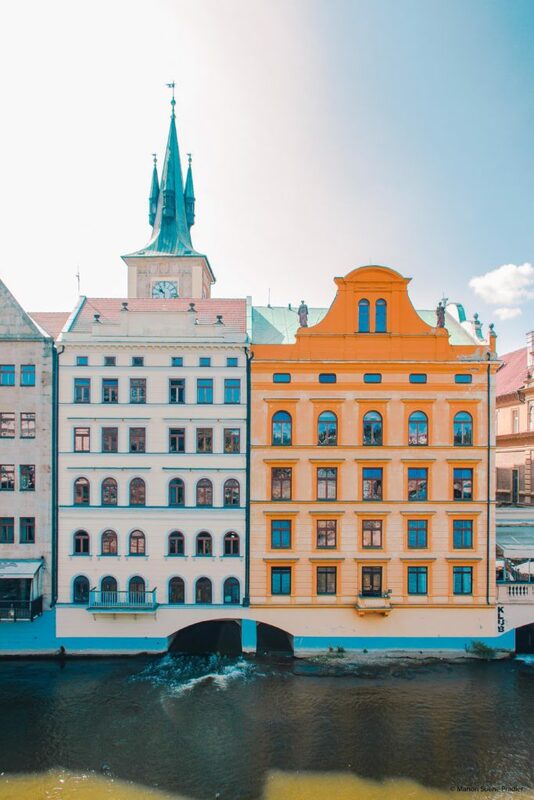 Prague, or Praha in Czech, is the capital of the Czech Republic which has about 1.4 million inhabitants (to give you an idea the urban area of Marseille has 1.8 million inhabitants). Traversed by the Vltava, Prague is located in a bowl surrounded by small hills that allow to admire it easily. 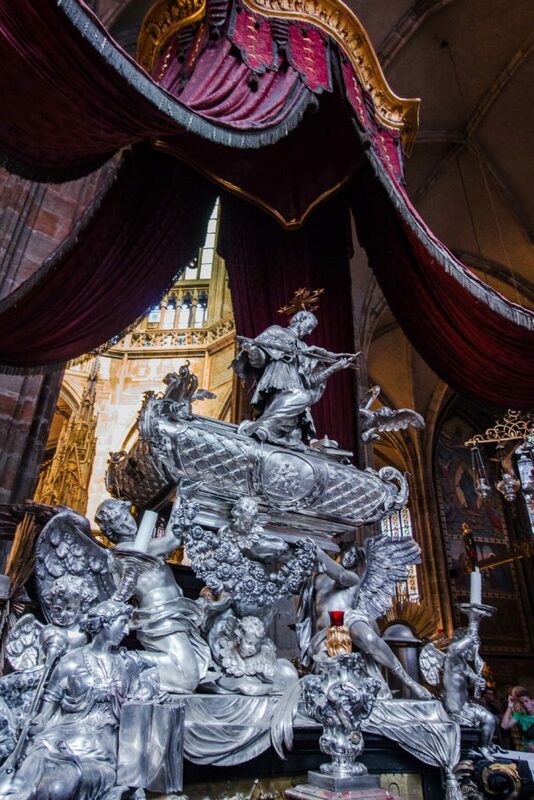 It was for a long time the capital of the Bohemian kingdom, then of the Holy Roman Empire. The Velvet Revolution in autumn 1989 finished to lift the veil on this capital by rushing the fall of the Czechoslovak Communist Party that followed from Berlin's can. 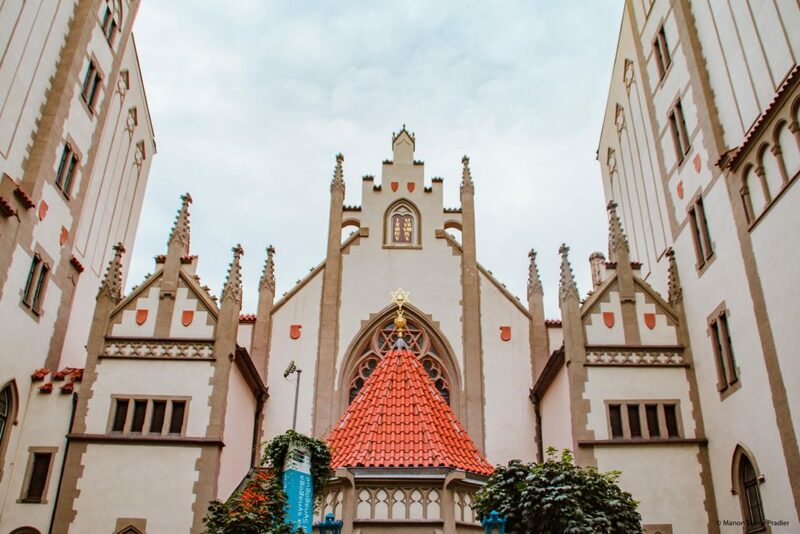 Dubbed "the city of Thousand Steeples", its architecture and heritage have survived the wars that have followed to deliver it to us today in all its splendour. 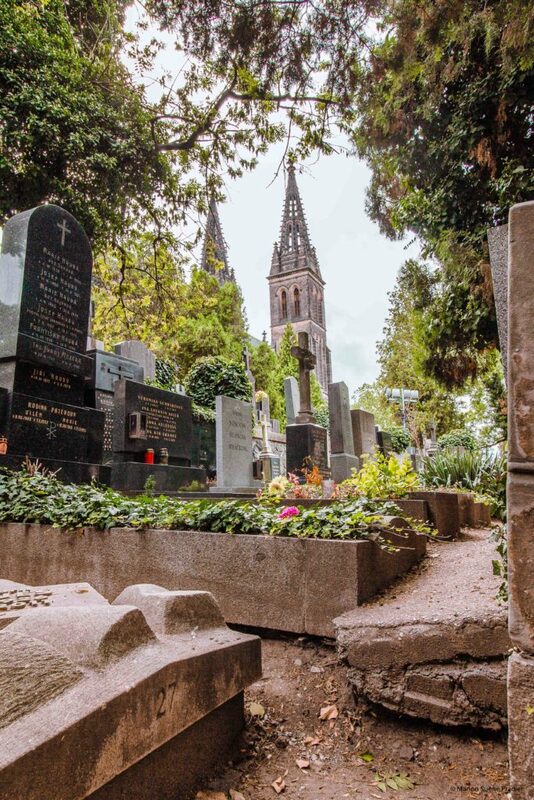 Romantic, colorful, André Breton described her as "the magical capital of Europe". 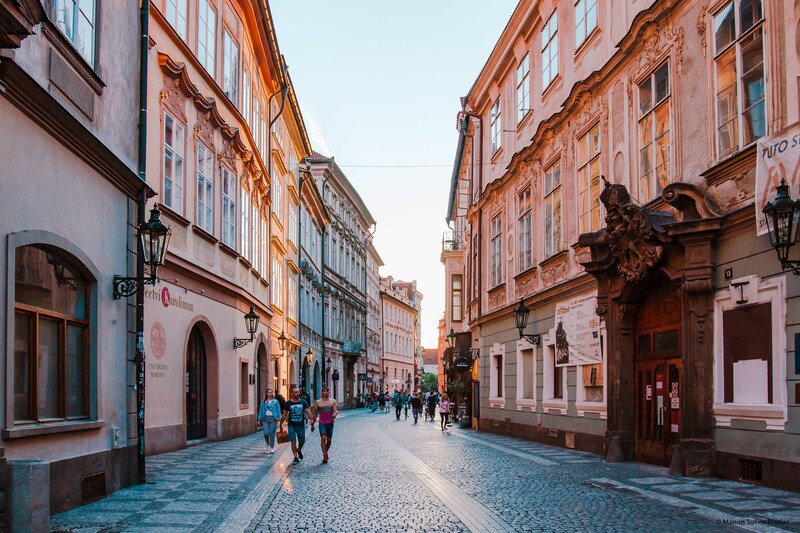 The history of Prague feels when you cross it. From this village which became a royal city, then an imperial city, to be today the joyful capital of a modern state. One can only succumb to the charm of this millennial city. Like most capitals, by train or airplane, or even carpool or bus for the bravest! 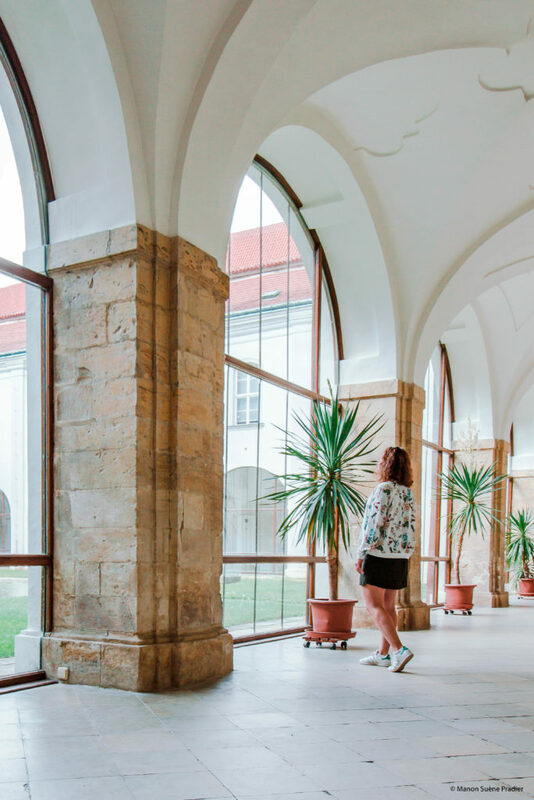 The central station, or Praha Wilsonovo nádraží, is located not far from the city centre and is extremely well served by underground C. It mainly allows you to visit the hinterland without the need to rent a car because the tickets remain relatively affordable. 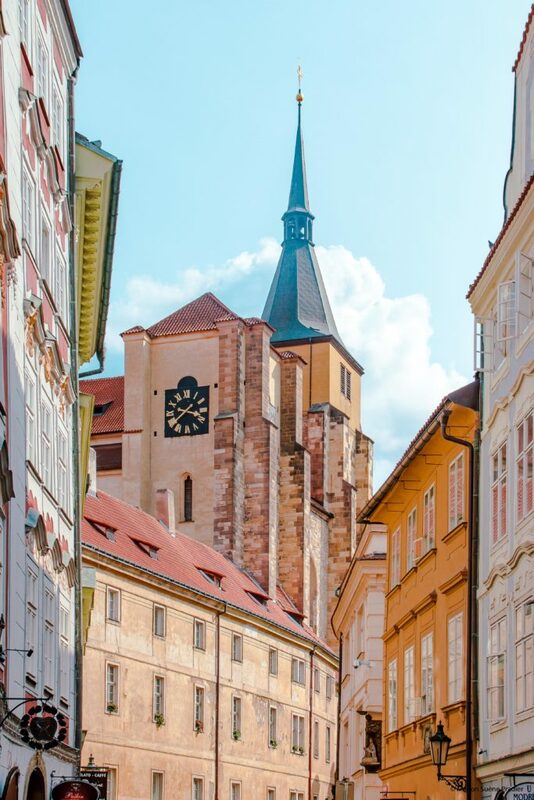 Attention, there is no direct connection by train between Paris and Prague, still count 4pm via Frankfurt or Nuremberg… However it is extremely convenient as this is where it takes the bus to the airport. 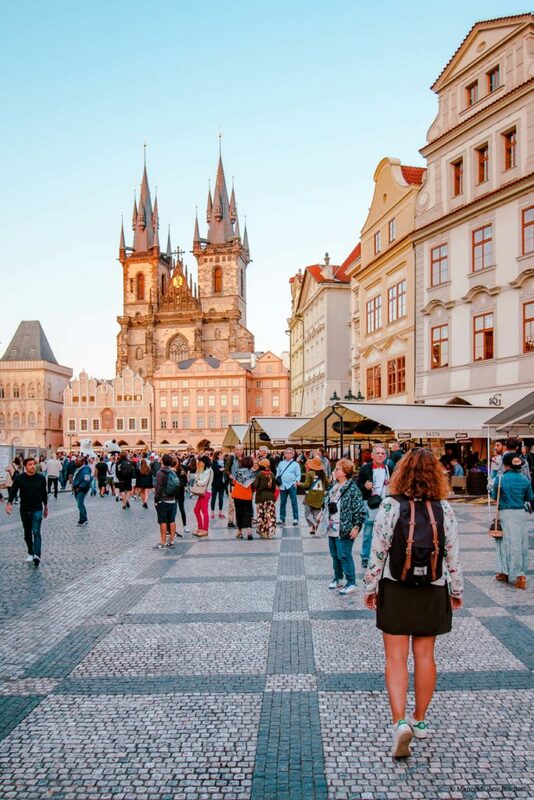 The airport Václav Havel is extremely well served and it is the means of transport that I recommend to travel to Prague because it is also the cheapest. 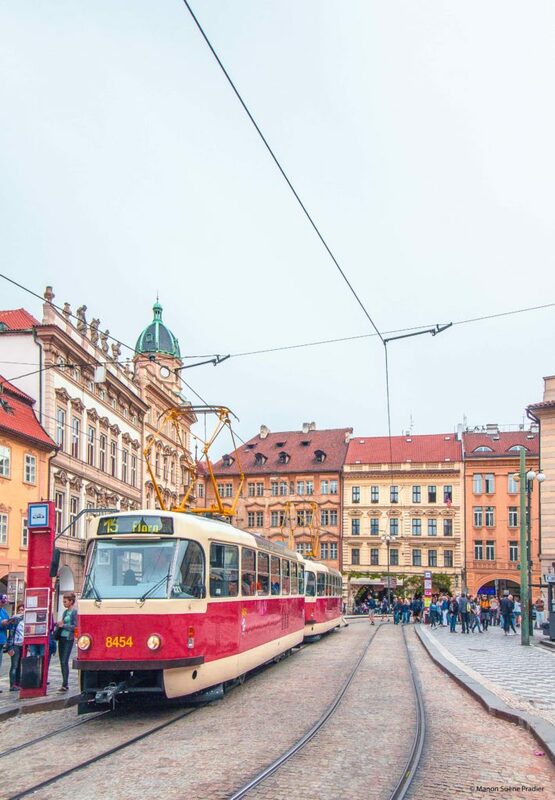 Moreover, the buses to reach the city centre are part of the Prague transport network, the ticket will cost you 32 crowns, or a little more than 1euro. No need to take a cab! You may have just a little trouble reading the transport map which is displayed outside the station. To know where the buses are, you have to follow the lines of the route to see if the number of the bus is written there… A little complex but it's easy to get used to! You will probably have to take buses 100 or 119. To get around the city there is a particularly efficient Tram network. However, if you are not afraid to walk, I would rather advise you to walk around, it is widely feasible! We walked about twenty kilometers a day which is quite reasonable when we spend the whole day outside! The district of Vysehard is located on a hill in the south of the city. 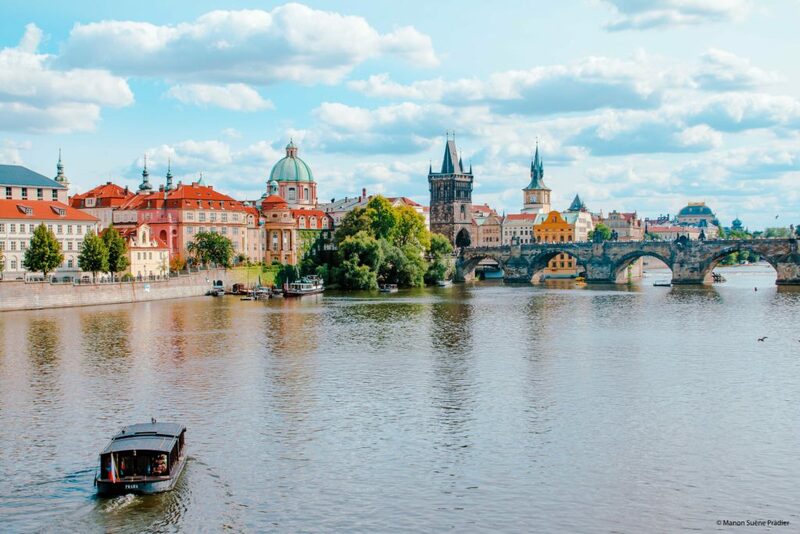 You will have to climb a number of steps before you can admire Prague and the Vltava in all their splendour. 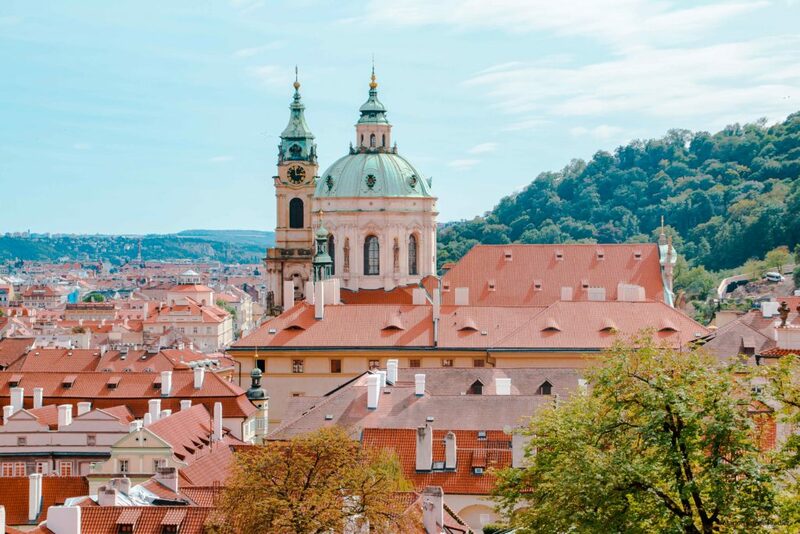 On the hill you will find a castle (nicknamed the second Castle of Prague) of the same name as well as its famous cemetery where many Czech personalities such as Alphonse Mucha are buried. 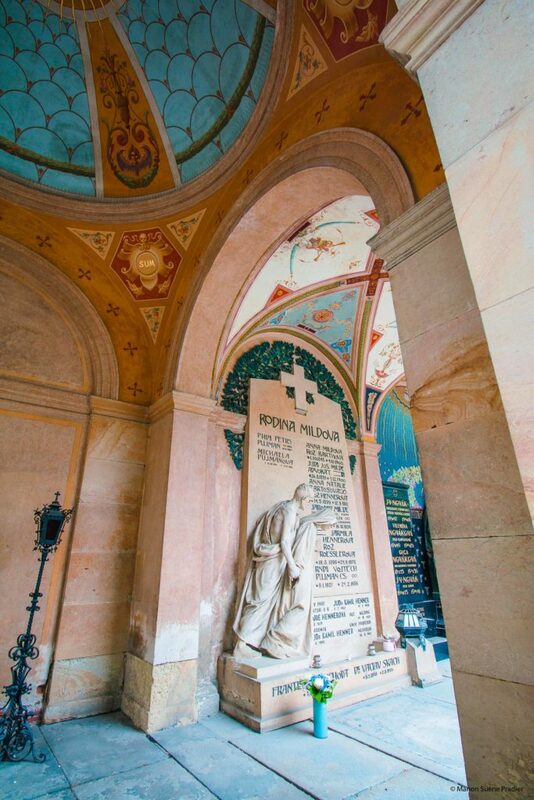 You will see that there are two other known and atypical cemeteries in Prague, the Jewish cemetery and the Olsanske Hirbrotvy Cemetery. You can see many sculptures, paintings and mosaics of great quality. 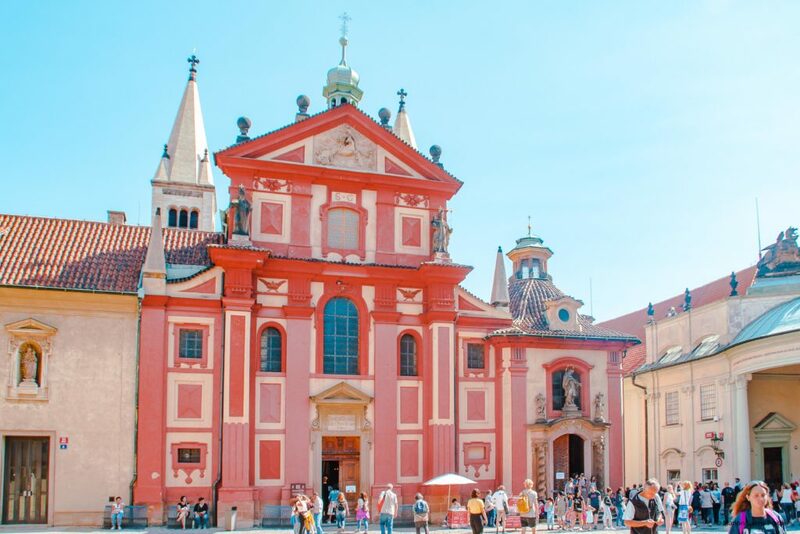 In the same area you can also admire the beautiful Basilica of St. Peter and Paul. 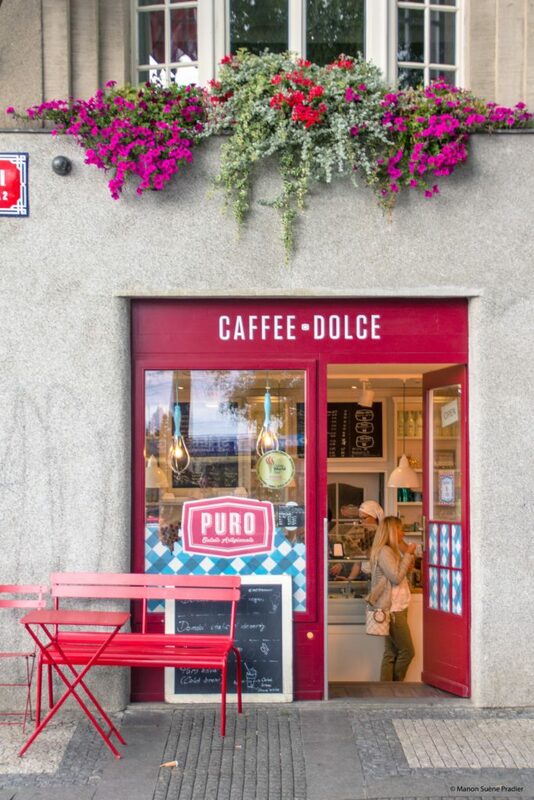 When I go back down I advise you to stop for an ice cream at Puro Gelato. 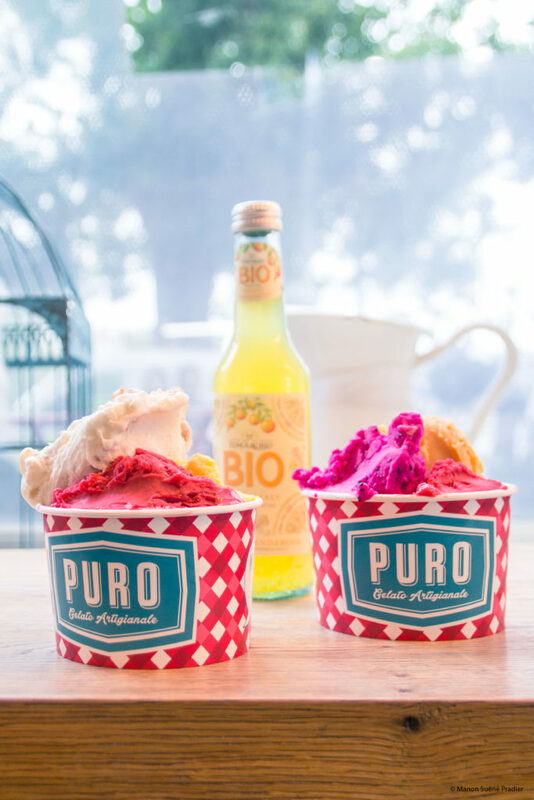 A large quantity of homemade ice cream, a wide vegan range and delicious fruit juices! 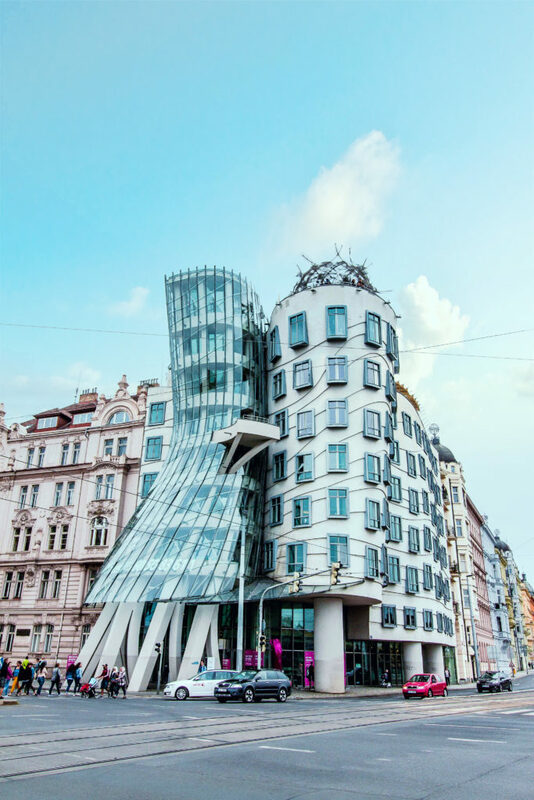 South of Prague you will find the new city whose "dancing houses" are the symbol. Colorful and vibrant, this area is much less touristy than the old town. It is good to walk there without specific purpose, the shores offer a beautiful view of the city and the castle. 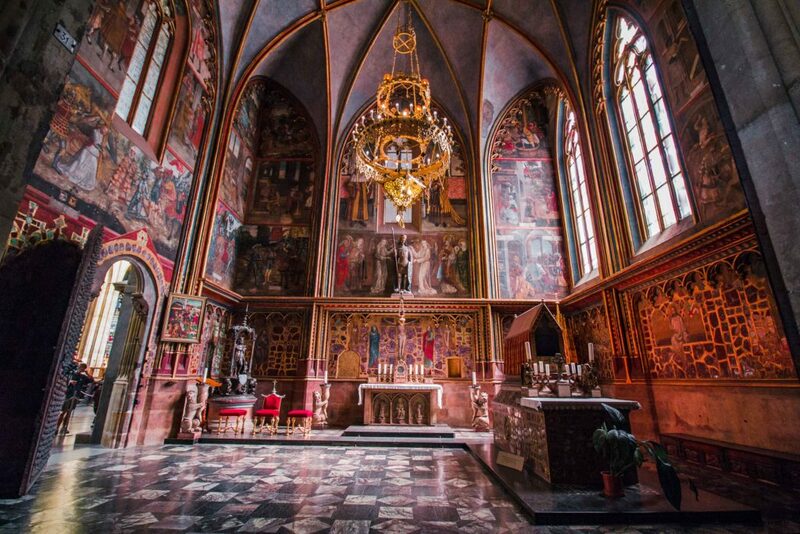 Extremely well preserved, this is the most romantic part of Prague. 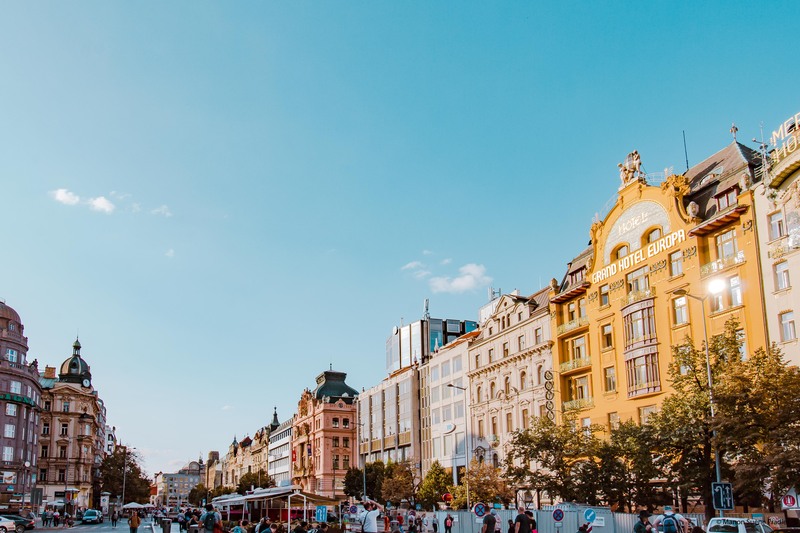 One of the biggest advantages of this city is probably its size, relatively small for a capital, it is possible to do everything on foot if one is healthy of course. Staroměstské náměstí: The Old Town square. 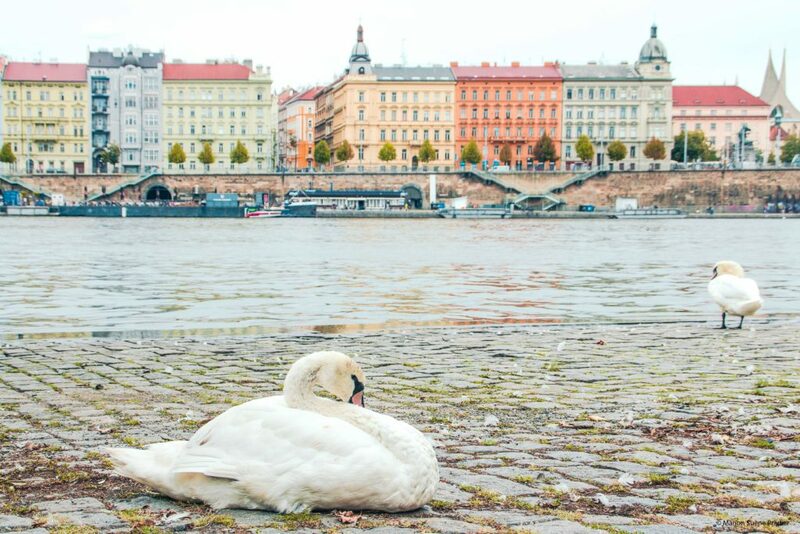 Probably the most famous place in Prague and the most majestic. Built in the 13th century, it is as sublime as rich in history and monuments. In fact, it is also extremely touristy in the middle of the season and many groups with a guide travel around it. To enjoy it fully, it is better to get up early! The church of Notre-Dame of Tyn is undoubtedly one of the most beautiful and imposing buildings in this square. 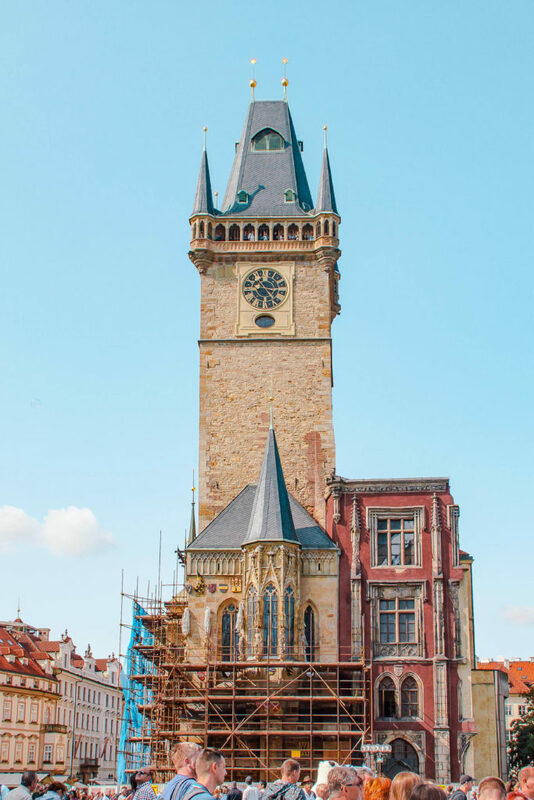 With its two monumental towers, its construction began shortly after the Saint-Charles bridge. 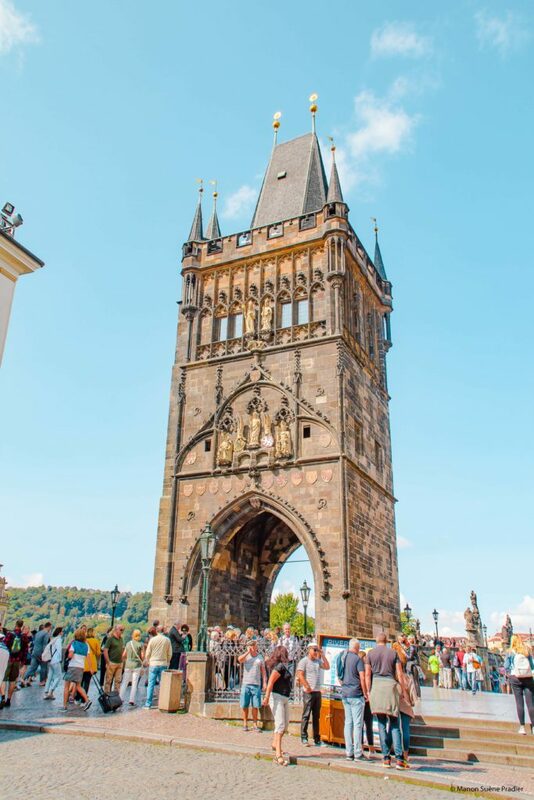 The powder tower is certainly the most famous tower in Prague. It was erected on one of the thirteen gates that surrounded the city as early as the 11th century. In reality she never had a defensive function, she had to add to the prestige of the palace which at the time was right next door. It gets its present name when it became a powder reserve during the 17th century. 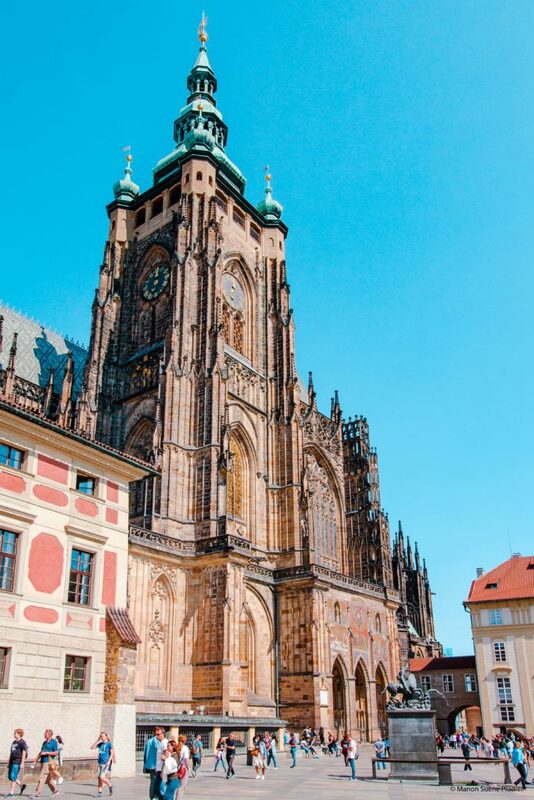 As with most of Prague's towers and monuments, you can climb to the top for about 5 euros. 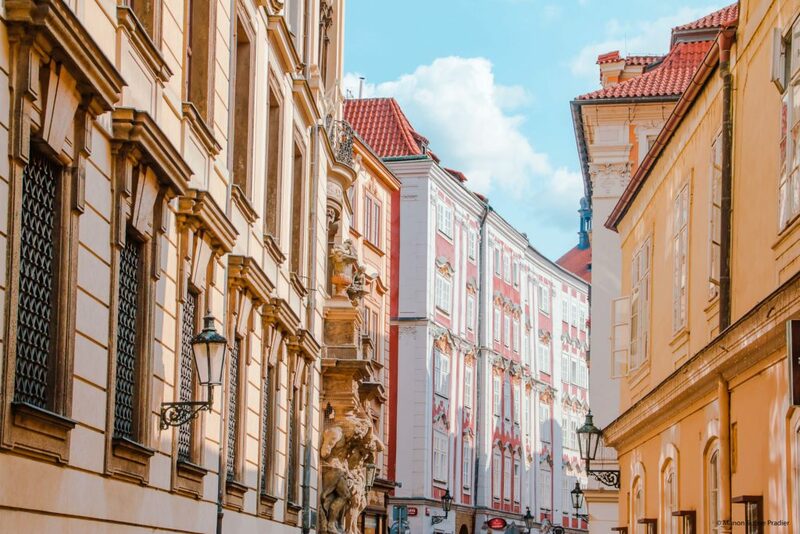 Also take time to stroll through the Jewish quarter, its majestic streets and buildings, its very special cemetery and its renowned museums. 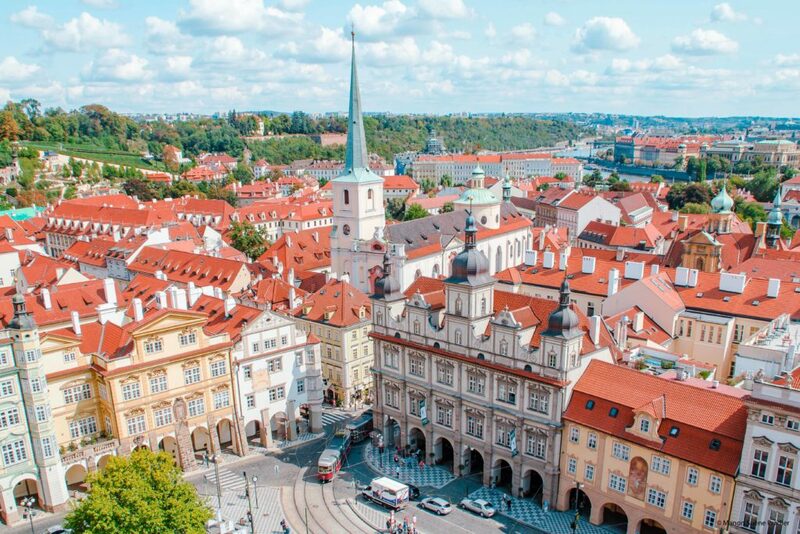 For me it is one of the most beautiful areas of Prague! 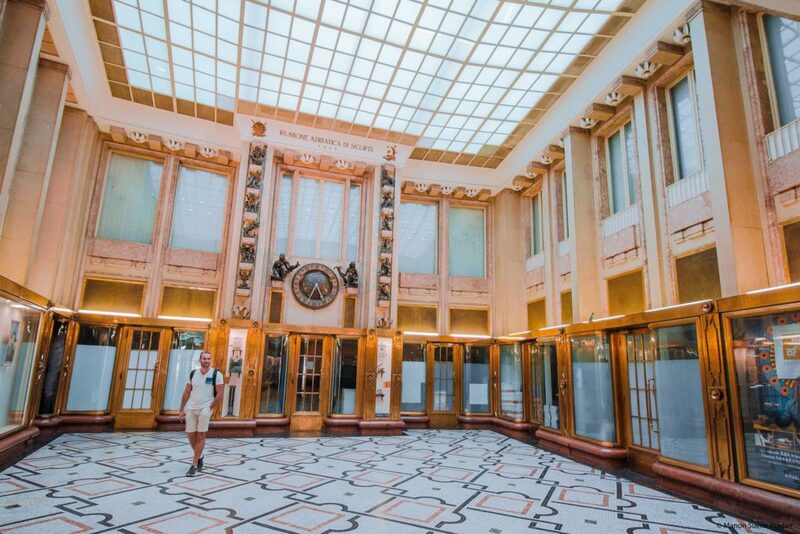 One of the charms of Prague is its many galleries which, like in Paris, create real passages through the city. At the beginning of the 20th century it was almost possible to cross the city centre just by borrowing them! A lot of these passages have been abandoned or are no longer open to the public because they have deteriorated under communism. However, here are the three best known that we took the time to visit. 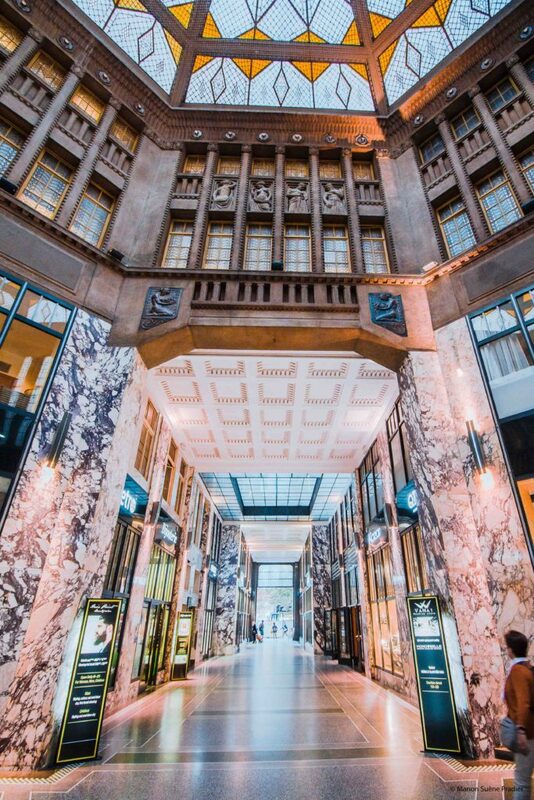 The Koruna passage is certainly more impressive because the biggest. 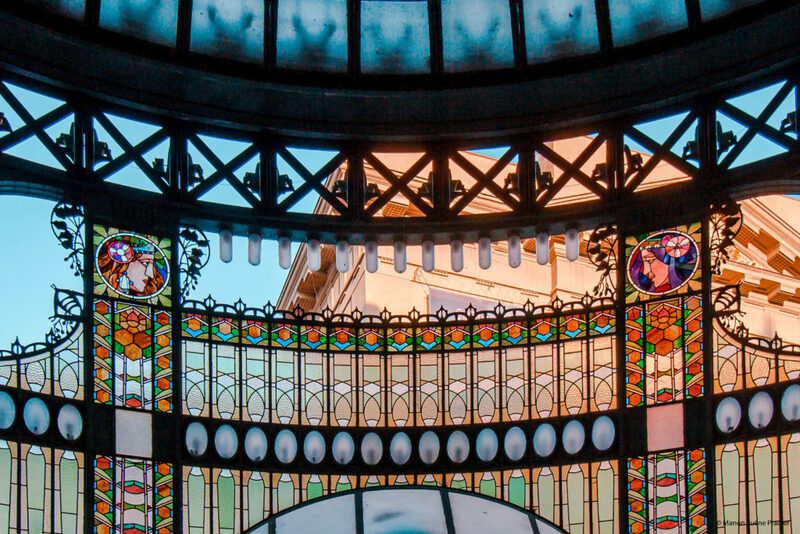 With his immense cupola "Art Nouveau", he transmits a certain majesty. Very unusual, it also houses a youth hostel, for those who wish to spend a night in this magical place. 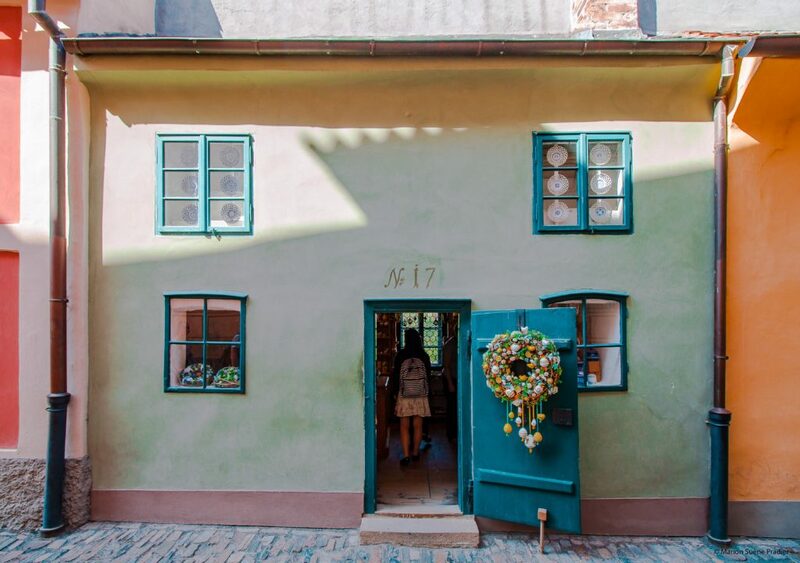 The Adria passage houses one of the most secret cafes in Prague. In a very particular Cubist style, no doubt he will be able to distinguish himself and charm you. 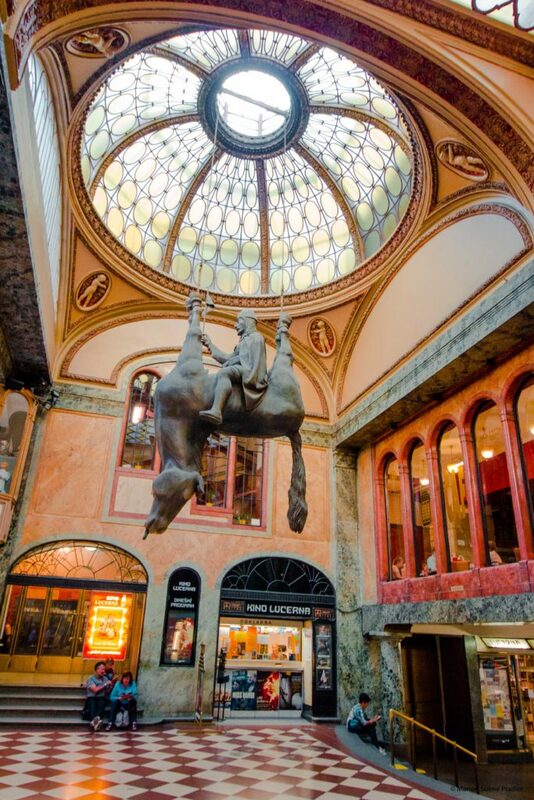 The passage Lucerna, he, is undoubtedly the most famous thanks to the statue of the toppled horse of David Cerna. 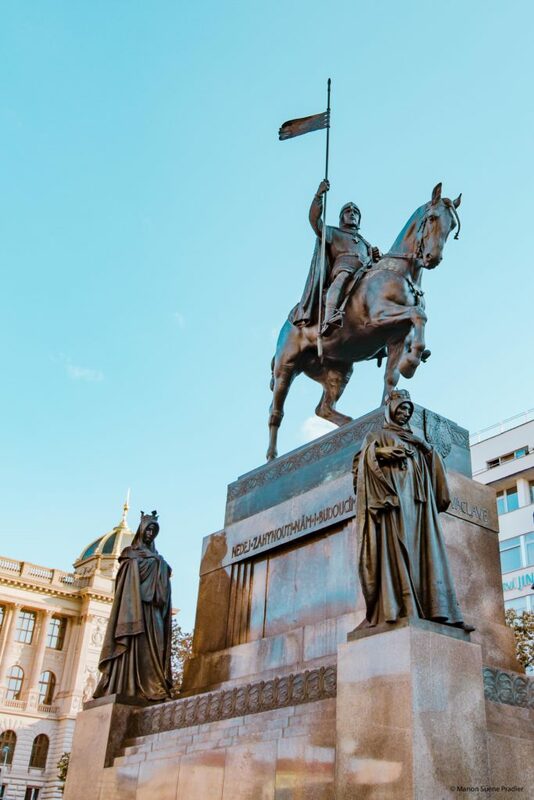 It symbolizes the fact that the Czech Republic will not return to the monarchy and refers to the statue of Wenceslas 1st, Duke of Bohemia and patron saint of the Czechs, which is located right next to the immense square of the same name. 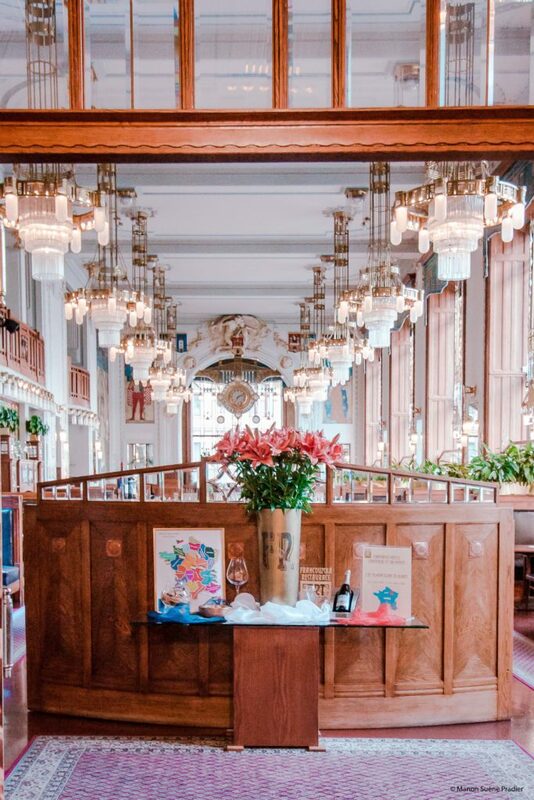 In this passage you will also find the first speaking cinema of the country which opened in 1929, as well as the Lucerna Music Bar, a great place to have a drink and dance. The Pont Saint-Charles is the most famous but also the oldest. 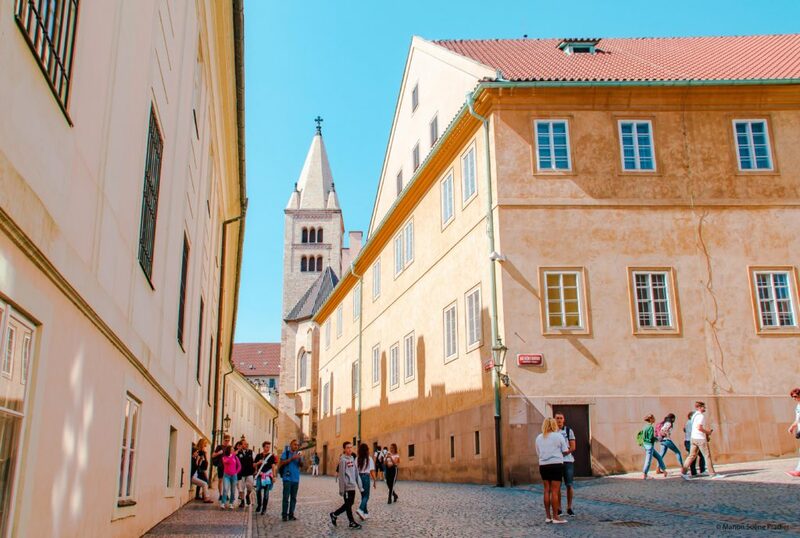 Fully pedestrian, it connects the old town to the castle. It replaces the Judith bridge which was destroyed by the floods of the river. 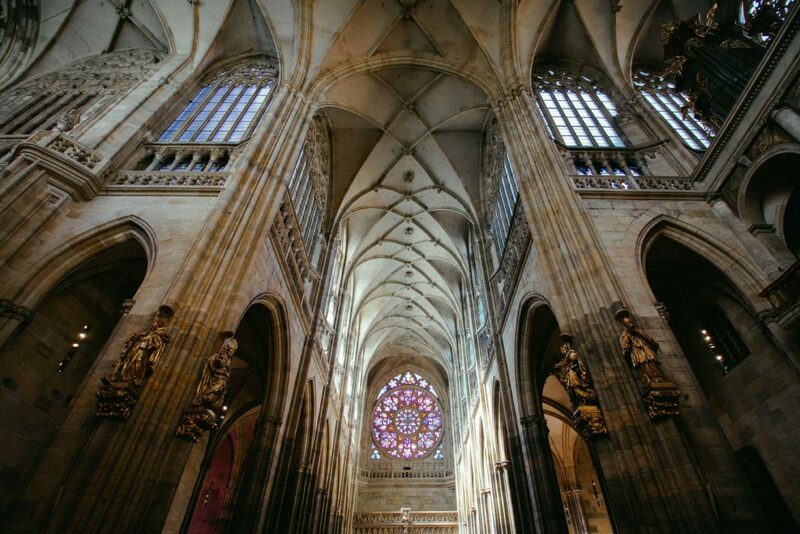 500m Long, the first stone was laid in 1357, its construction continued until 1380. On each side it is guarded by a Gothic tower. 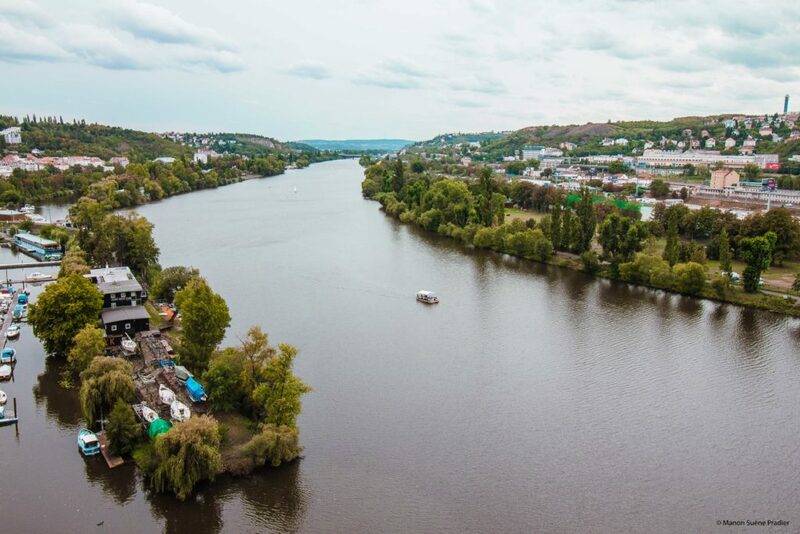 Until the end of the 18th century it was also the only bridge that spanned the Vltava. In the 17th century, and to imitate the Saint-Anges bridge in Rome, the Catholics added thirty statues to him on both sides. 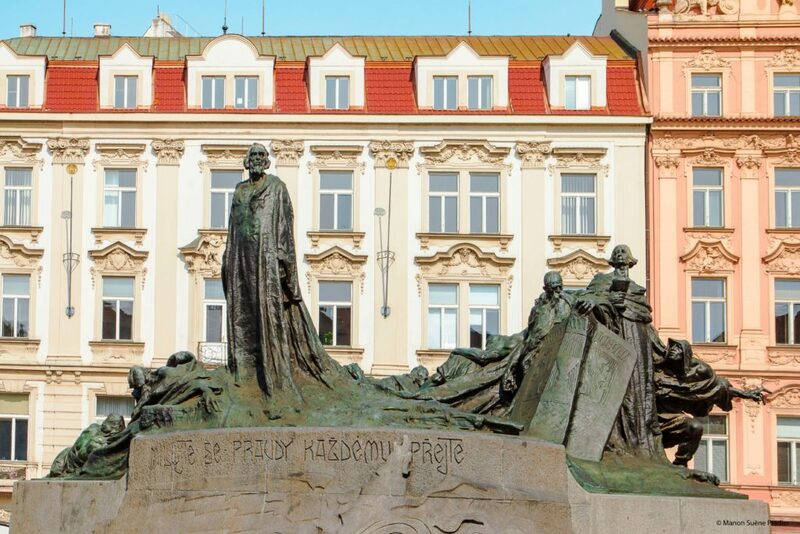 The most famous of these statues and that of Jean Nepomuk who was thrown over the bridge by King Wenceslas IV because he had not wanted to repeat what the Queen had entrusted to him. At the foot of this statue you will find a gold cross in memory of this act, but you will see mostly hordes of tourists jostling to touch it. Probably to bring luck, who knows! The most Legi bridge allows to have a very nice view on the Pont Saint-Charles and the castle. Just across the bridge you can admire the Prague National Theatre and its magnificent architecture. If you have the courage to walk up it is a beautiful stroll that allows to reach the heights of the city and especially the castle. If not, don't worry, there's the cable car! 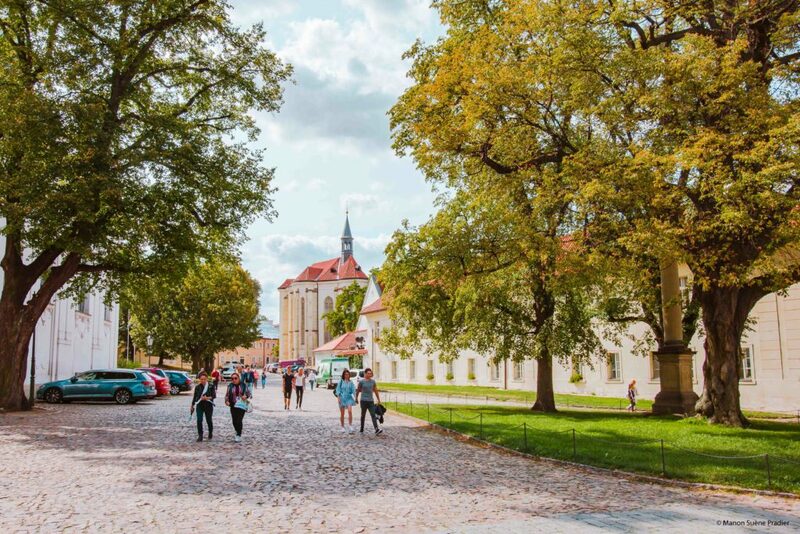 Take a moment to stroll through the Petrin Gardens, visit the Rose Garden and see the astronomical observatory as well as the Petrin tower. 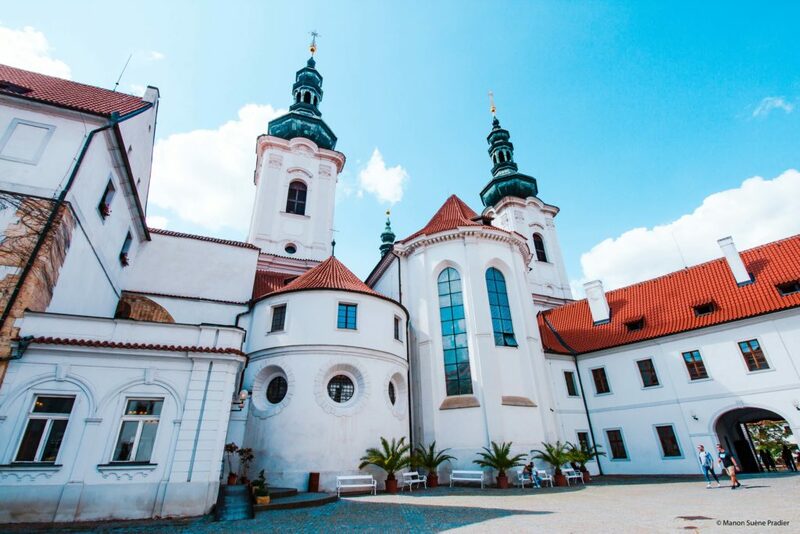 But before visiting the castle, take the time to discover the monastery of Strahov away from the tourists. 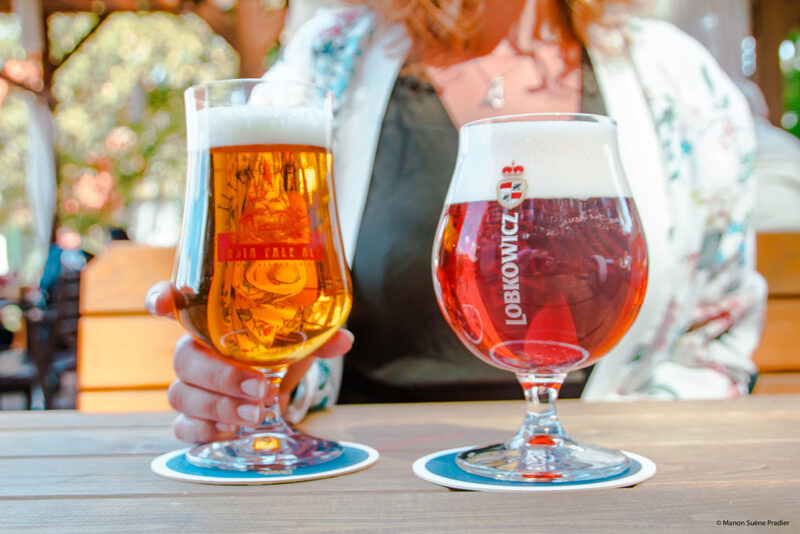 And in addition you will find a very adorable Beergarden where you can taste the St. Norbert, a beer brewed in the monastery since the Middle Ages while nibbling a platter of cheeses copile. The Beergardens are a kind of beer bar that you will find all over the city. 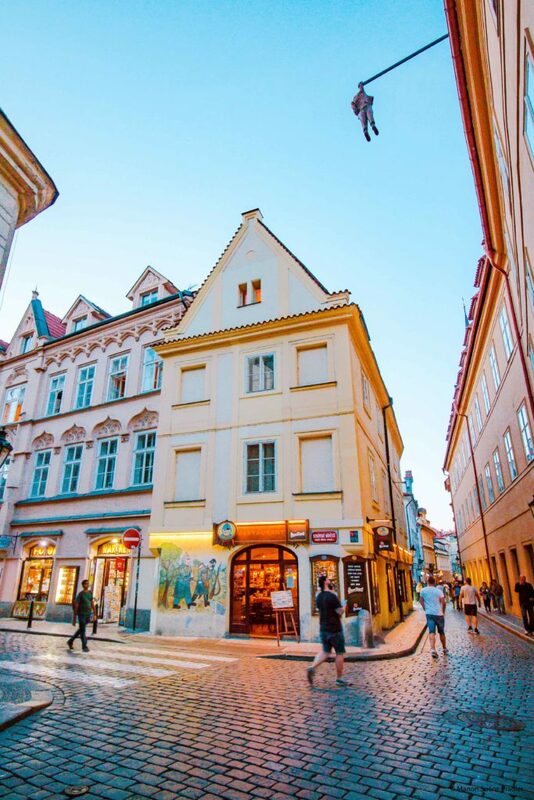 Most of the time you can drink local and little-known beers at the terrace of a small cosy bar while nibbling. Active since 1140, it is a quiet place with a very special atmosphere. 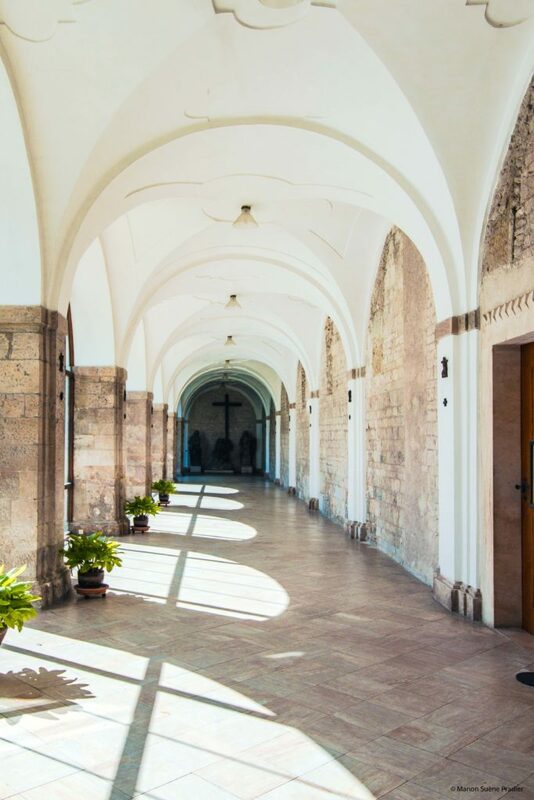 You will soon realize that few people visit the buildings, they often just go around what is very unfortunate about the monastery. The Romanesque abbey was changed several times until it became Gothic. 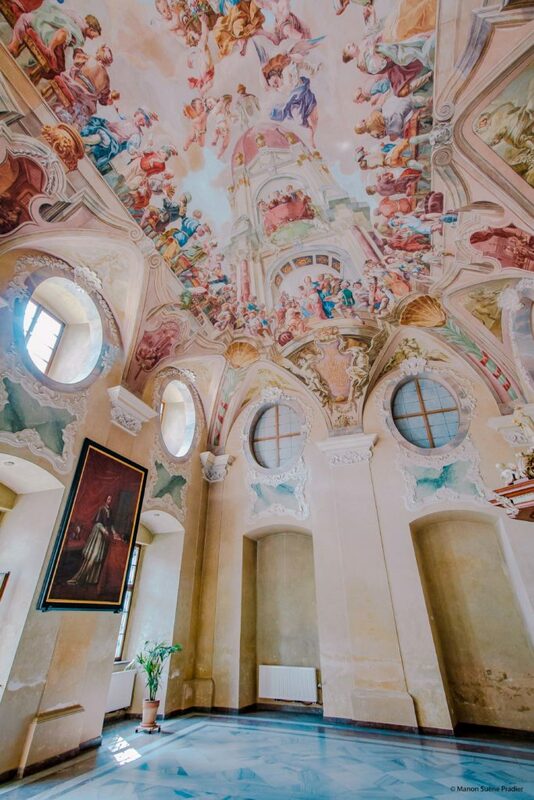 If you enter the church, you can see through the gates the relics of St. Norbert as well as a magnificent painted ceiling. Unfortunately the church is only open during the office at 6pm. 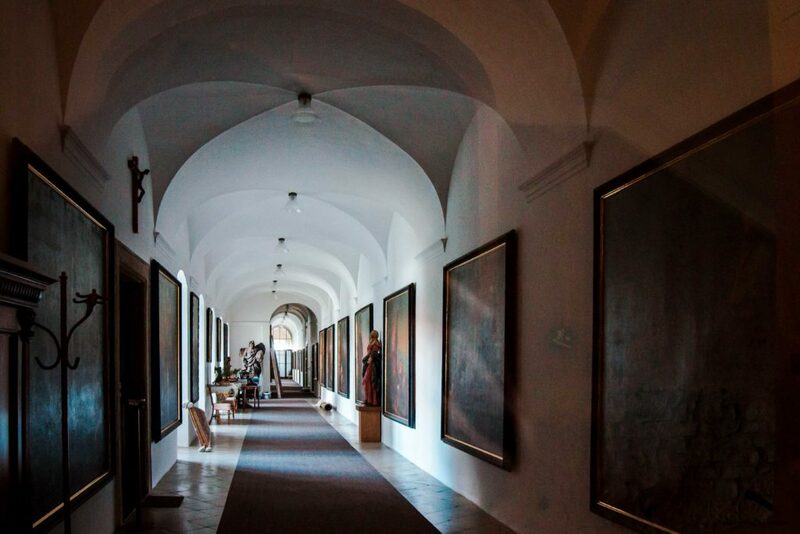 As with most places to visit in Prague, you have to take a ticket for each part… So one for the monastery and the gallery, and another for the library. 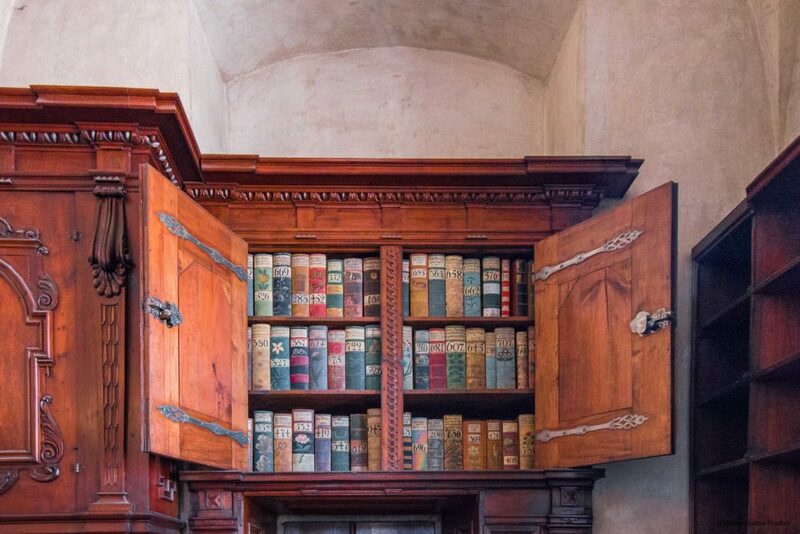 This is why we have not visited the latter in order to give preference to other places… However the library is extremely well known and a real gem of Baroque architecture that I strongly advise you to go and see! The most adorable way to get to the castle is undoubtedly that of the "old staircase of the castle" which runs along the vineyards dating from the 10th century. You will have a breathtaking panorama! 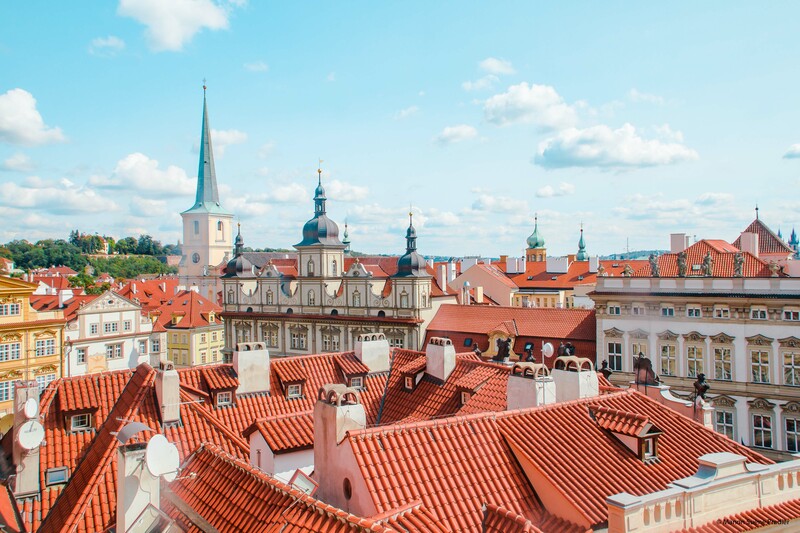 The site of the castle is undoubtedly the most important historical monument of the Czech Republic, the seat of political and religious power since the 9th century. It is still today the seat of the President of the Republic. It is actually made up of several palaces, churches and gardens. There are several "packages" to visit this unique place, the most expensive costs about 10-12 € to have access to: the Cathedral of Saint-Guy, the old royal palace, the Basilica of St. George, the Golden Alley. Just like in Buckingham you will be able to attend the succession of the Royal Guard! 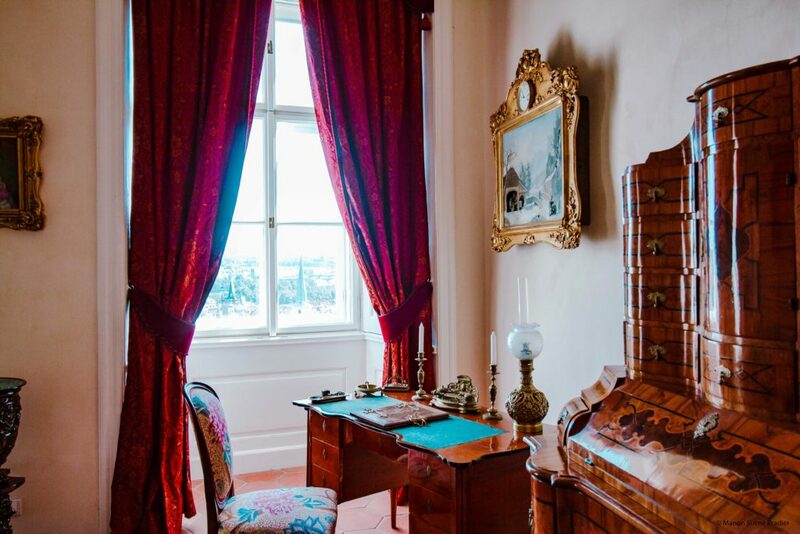 The present aspect of the castle dates from the 18th century and from Queen Marie-Thérèse who undertook major renovations. The building is now the official residence of the President of the Czech Republic. 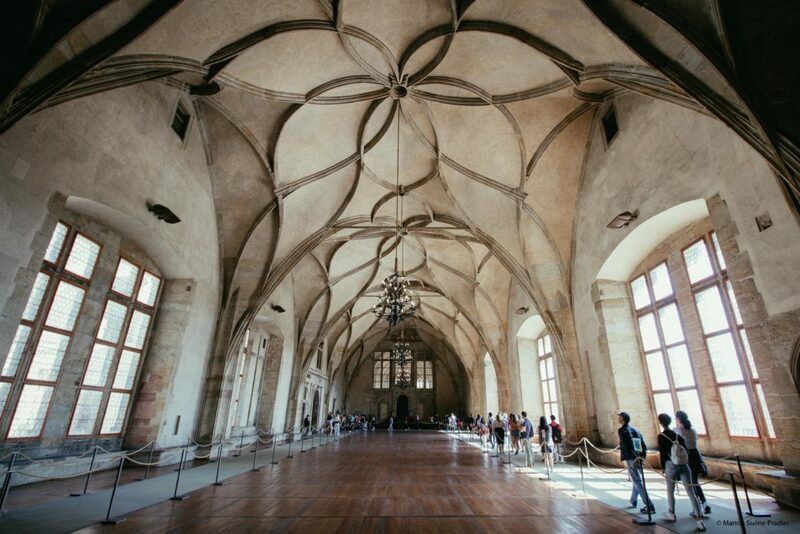 Guests can visit the old Royal Palace and its gothic-style vaulted room. 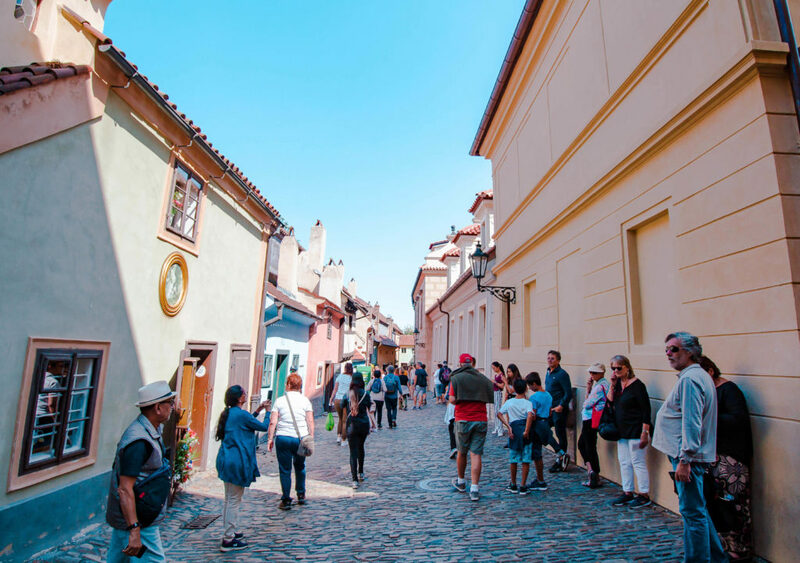 The Golden Alley is a street made up of small houses inhabited by the Archers and the staff of the castle and then by Alchemists, hence its name. 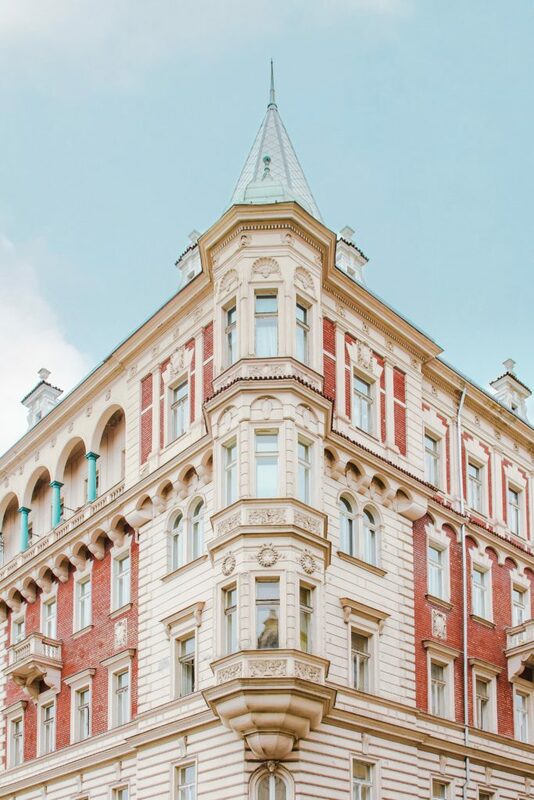 Many artists have also lived there, among them you will find Kafka's house. There are also several shops where you can buy complete hand-made armour! The Cathedral of Saint-Guy has a very special history. 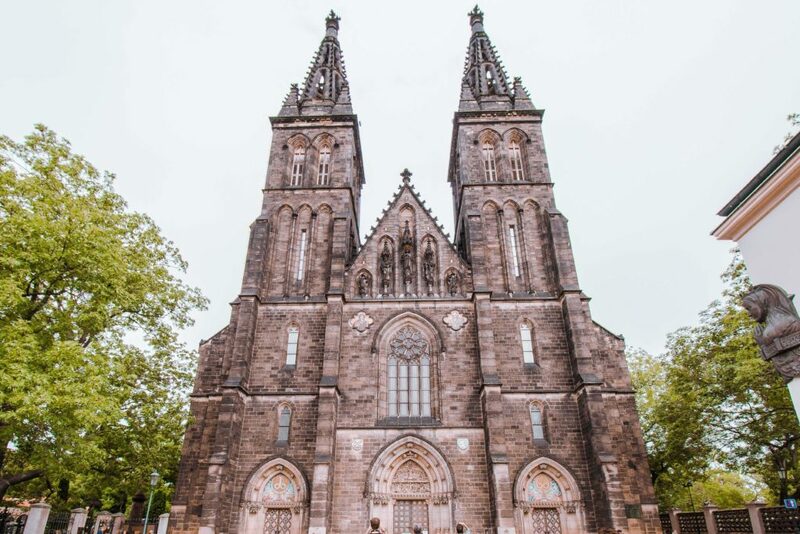 The construction of the cathedral began in 1344 under Charles IV on the site of a Romanesque basilica. 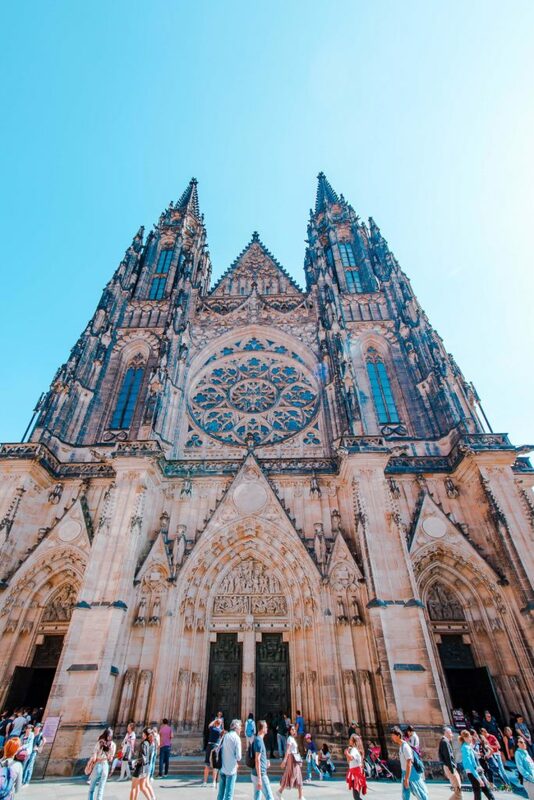 Its construction was slowed by several fires and revolts, so it was only completed in 1929, almost 6 centuries after the start of its construction! That is why there is a very rare thing, photographs of a cathedral under construction. 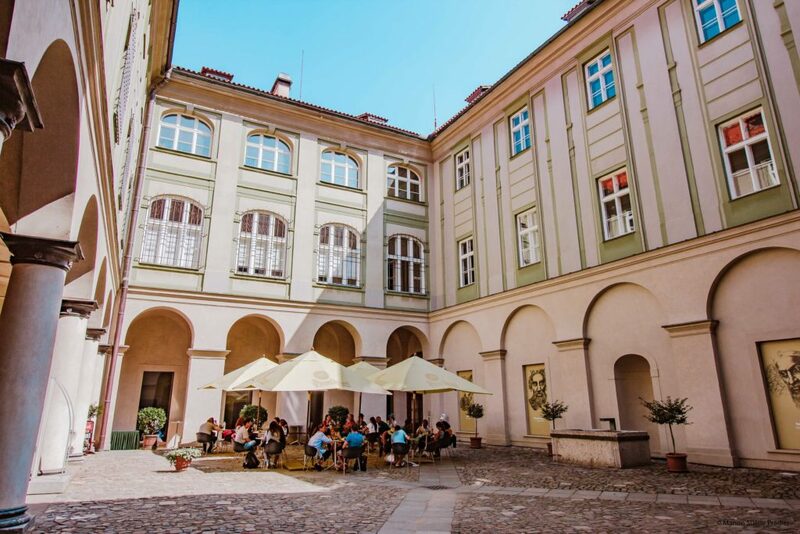 Palazzo Lobkowicz is a baroque palace located at the end of Prague Castle, near the exit leading to the castle's old staircase. The palace is held by the Czech House of the Lobkowicz, and thus constitutes the only building of the castle held by an individual. 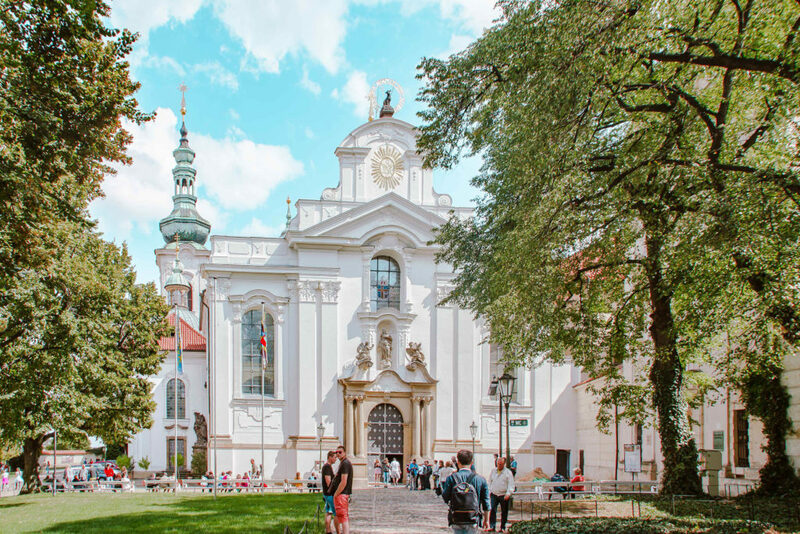 Founded in the year 920, the ancient Basilica of St. George and the monastery have undergone an extension in 973 which now hosts the 19th century Bohemian art collection of the National Gallery of Prague. Immediately forget all your priori on food in eastern Europe and open wide eyes and taste buds. 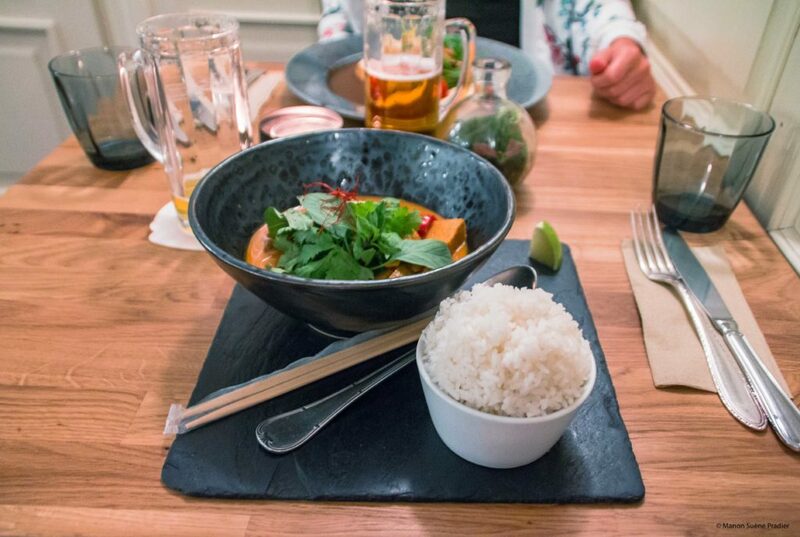 Sir and I do not eat meat and very few fish (except rare occasions or to disturb anyone) so it is sometimes difficult to eat outside especially in a country whose gastronomy we do not know. 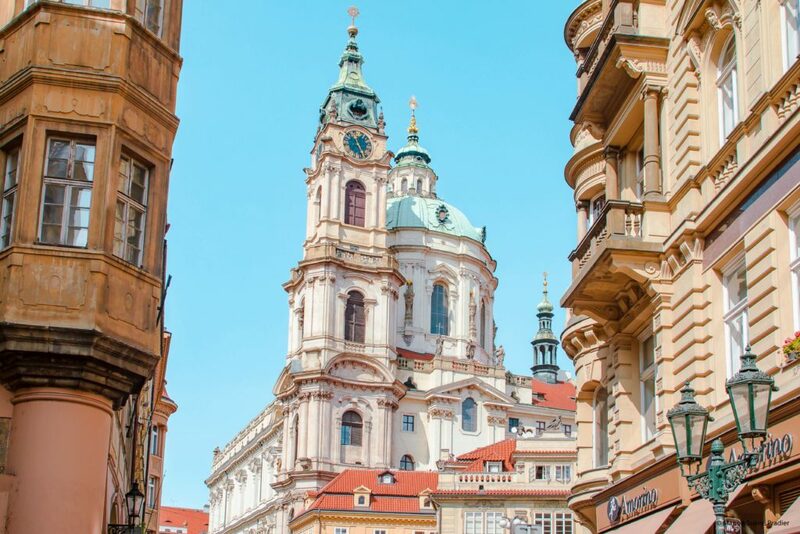 We were more than surprised by Prague, any small bakery, any burger or restaurant declines its dishes for all types of diets: omnivore, vegetarian, vegan, gluten-free…. Imagine our joy! 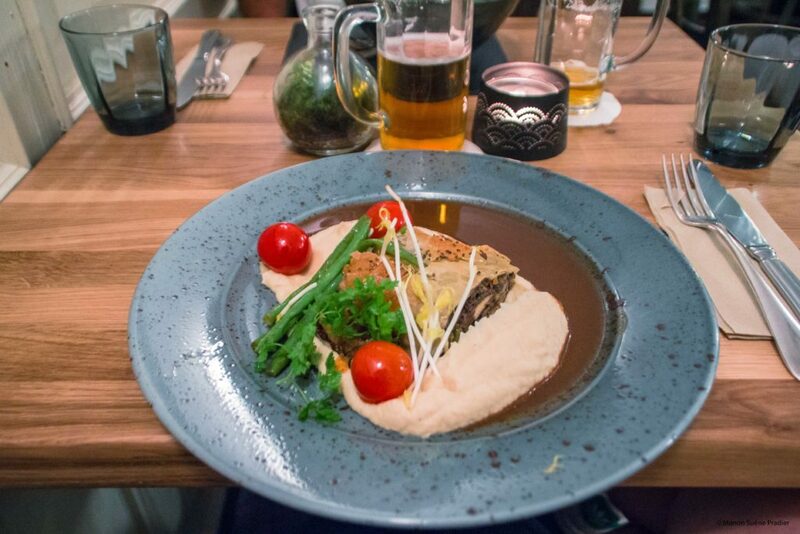 While in France it is very difficult to evolve our culinary traditions, the Czechs are very open. So you can eat almost anywhere, whatever your diet! Vegetarian and vegan friends, I can hear you already jumping for joy! You will also find many foodtrucks that prepare a lot of things houses, because yes, the homemade is also one of their peculiarity. 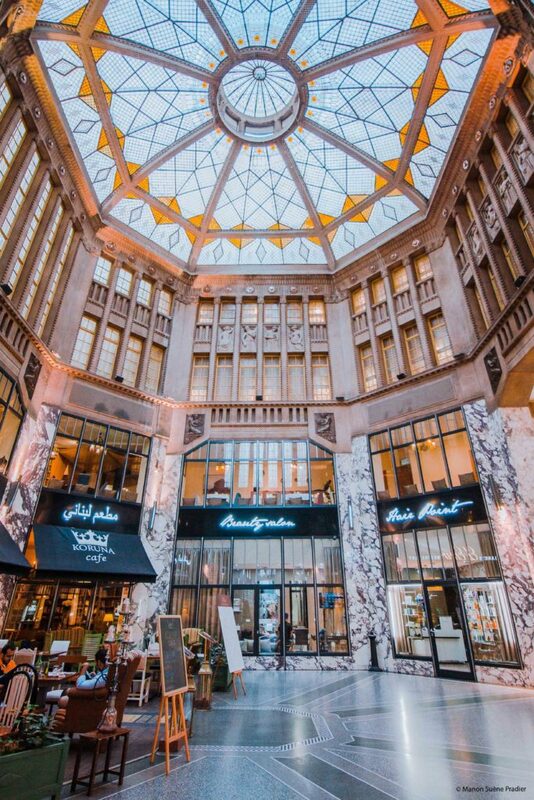 Without counting the prices, especially low, count €14 for a dish of homemade gnocchi, champagne sauce and truffles. It feels like it, doesn't it? Namely, as in most other European countries, cutlery, water, bread, are not understood. Here however a selection of places where we could eat! 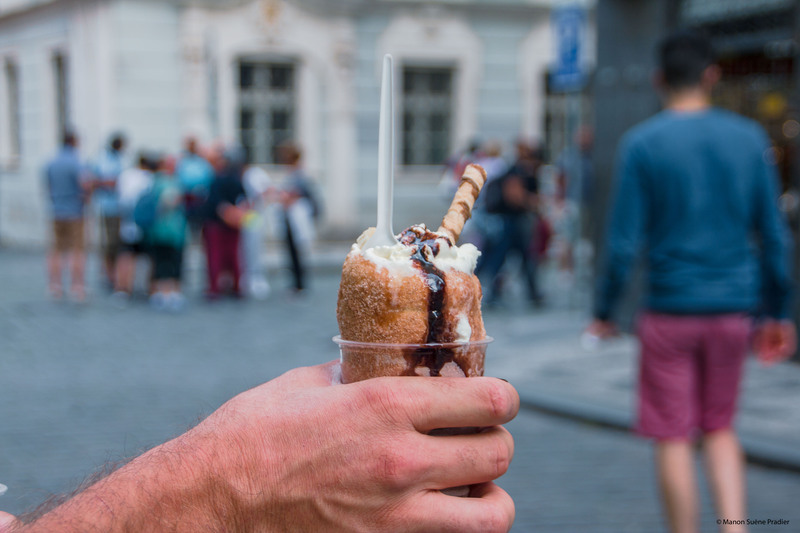 "Trdelnik" speciality Czech, nature, with fruit, with ice… A real treat! Our favorite, Estrella, a vegetarian and vegan restaurant not far from the old town. Everything is homemade and really good, we feasted! 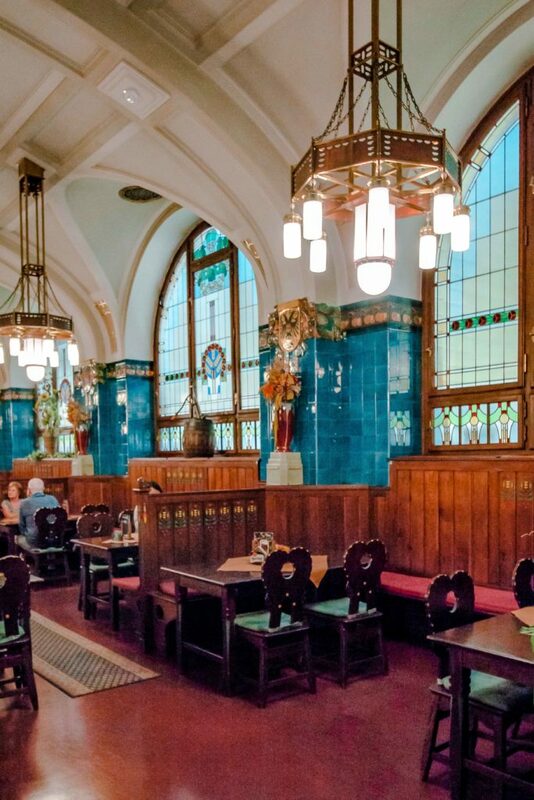 Count about €16 per person for a beer, a dish and a dessert. 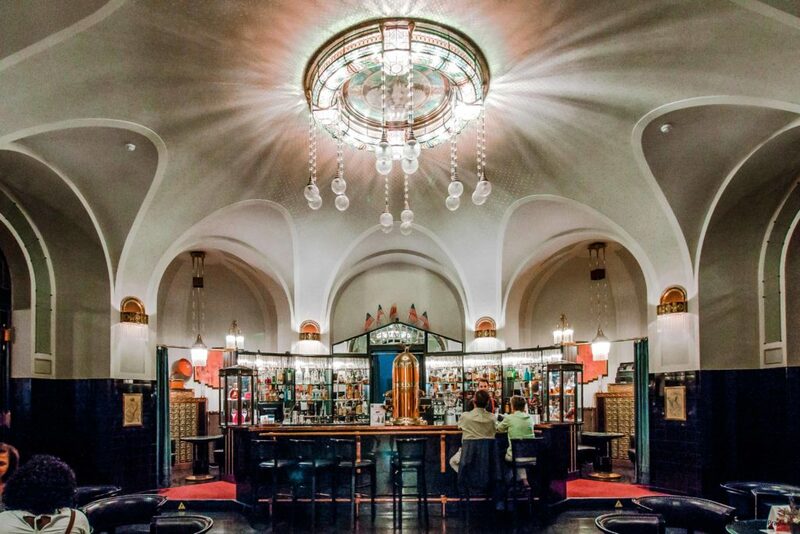 The café of the Municipal house, Café Karva Obecni Dum, is one of the emblematic places of the Czech cultural heritage. 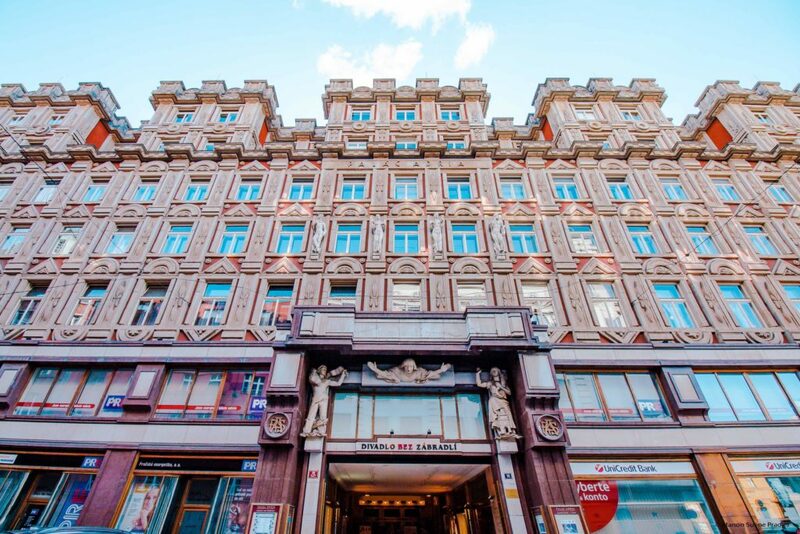 Built at the beginning of the 20th century, this versatile building that houses a concert hall, lounges, restaurants and cafes, all decorated by Czech artists from the beginning of the previous century. Much to spend a great evening on the terrace with a glass and a platter of cheese. 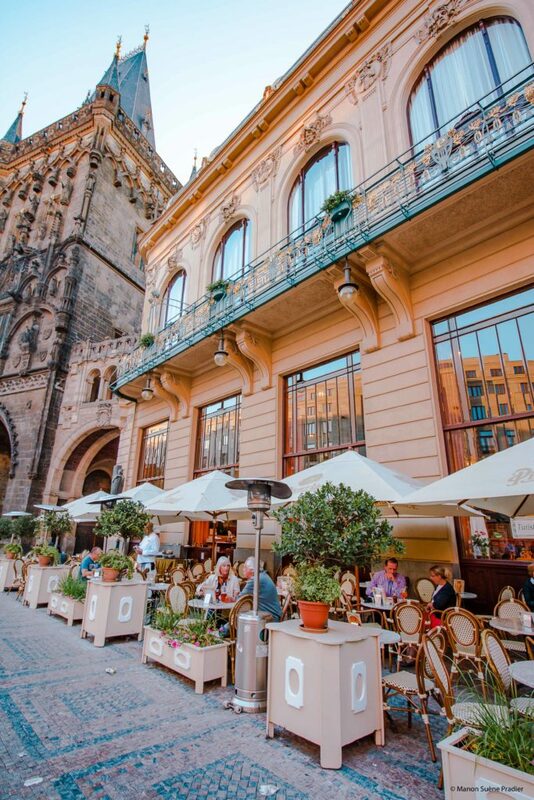 You will find other cafés in this spirit in Prague, the Café Louvres, the Grand Café Oriental, and the Imperial Cafe. Be careful if you want to eat there you will have to think about booking! 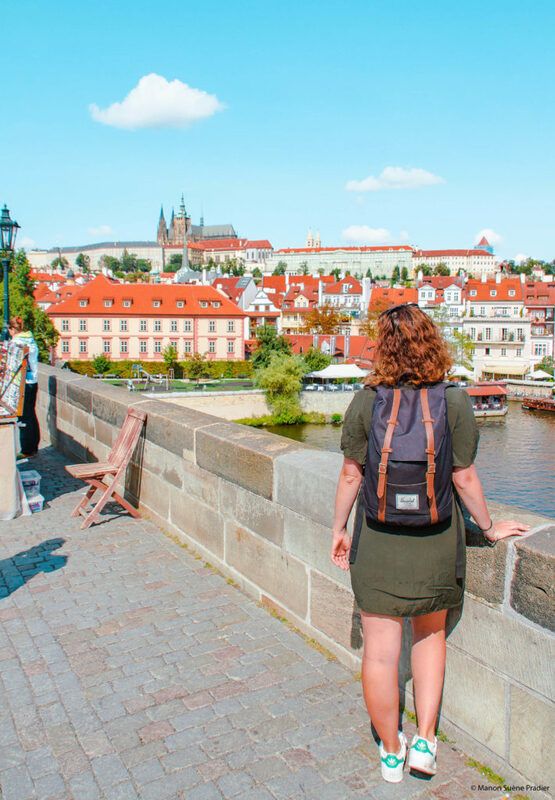 I hope this article will have made you want to visit this beautiful capital Prague! Your photos are absolutely beautiful! 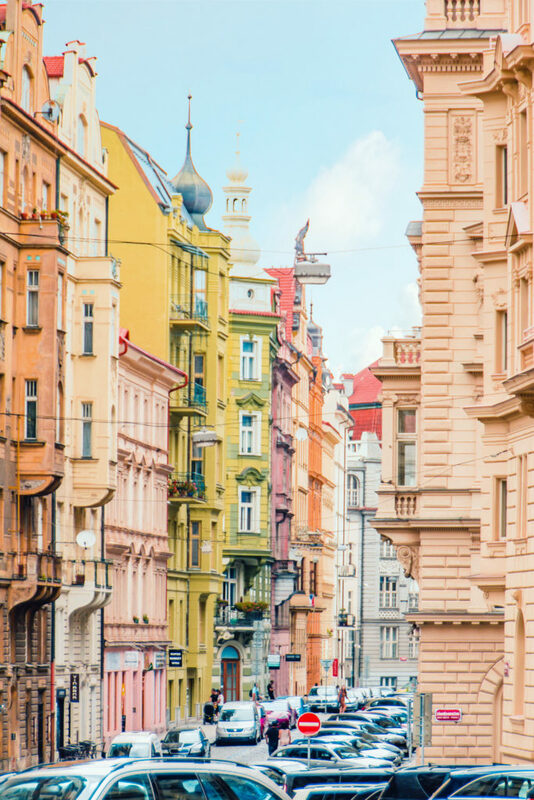 I haven’t been to Prague yet, but now I really want to go!